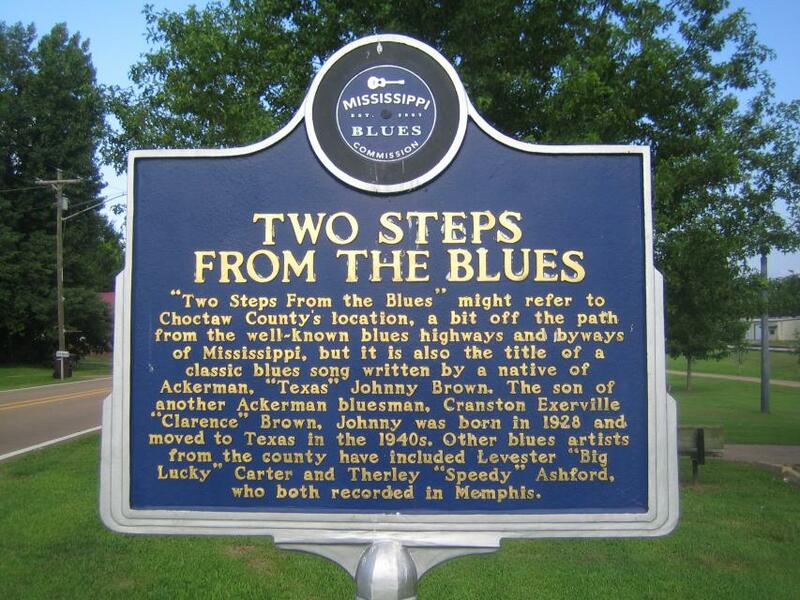 "Two Steps From the Blues" might refer to Choctaw County's location, a bit off the path from the well-known blues highways and byways of Mississippi, but it is also the title of a classic blues song written by a native of Ackerman, "Texas" Johnny Brown. The son of another Ackerman bluesman, Cranston Exerville "Clarence" Brown, Johnny was born in 1928 and moved to Texas in the 1940s. 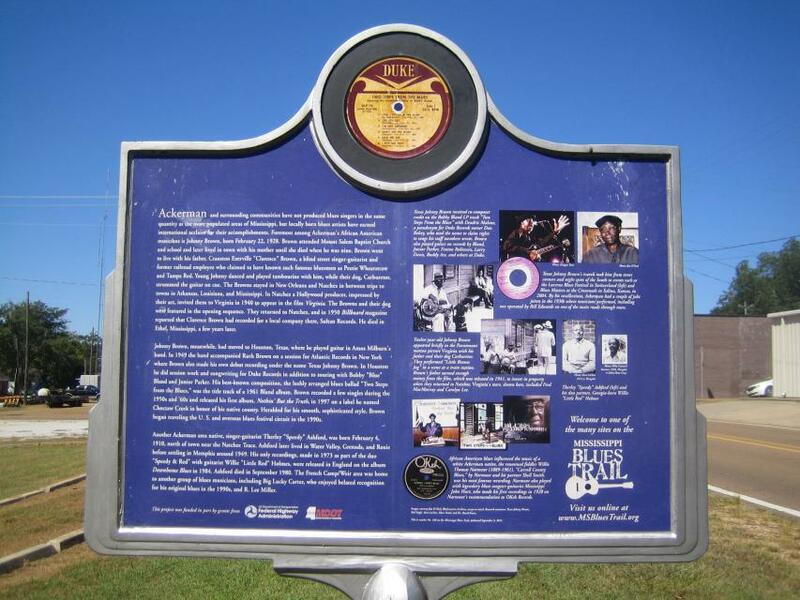 Other blues artists from the county have included Levester "Big Lucky" Carter and Therley "Speedy" Ashford, who both recorded in Memphis. Ackerman and surrounding communities have not produced blues singers in the same quantity as the more populated areas of Mississippi, but locally born blues artists have earned international acclaim for their accomplishments. Foremost among Ackerman's African American musicians is Johnny Brown, born February 22, 1928. Brown attended Mount Salem Baptist Church and school and later lived in town with his mother until she died when he was nine. Brown went to live with his father, Cranston Exerville "Clarence" Brown, a blind street singer-guitarist and former railroad employee who claimed to have known such famous bluesmen as Peetie Wheatstraw and Tampa Red. Young Johnny danced and played tambourine with him, while their dog, Carburetor, strummed the guitar on cue. The Browns stayed in New Orleans and Natchez in between trips to towns in Arkansas, Louisiana, and Mississippi. In Natchez a Hollywood producer, impressed by their act, invited them to Virginia in 1940 to appear in the film "Virginia." The Browns and their dog were featured in the opening sequence. They returned to Natchez, and in 1950 Billboard magazine reported that Clarence Brown had recorded for a local company there, Sultan Records. He died in Ethel, Mississippi, a few years later. Johnny Brown, meanwhile, had moved to Houston, Texas, where he played guitar in Amos Milburn's band. In 1949 the band accompanied Ruth Brown on a session for Atlantic Records in New York where Brown also made his own debut recording under the name Texas Johnny Brown. In Houston he did session work and songwriting for Duke Records in addition to touring with Bobby "Blue" Bland and Junior Parker. His best-known composition, the lushly arranged blues ballad "Two Steps from the Blues," was the title track of a 1961 Bland album. Brown recorded a few singles during the 1950s and '60s and released his first album, "Nothin' But the Truth," in 1997 on a label he named Choctaw Creek in honor of his native county. Heralded for his smooth, sophisticated style, Brown began traveling the U. S. and overseas blues festival circuit in the 1990s. Another Ackerman area native, singer-guitarist Therley "Speedy" Ashford, was born February 4, 1910, north of town near the Natchez Trace. Ashford later lived in Water Valley, Grenada, and Roxie before settling in Memphis around 1949. His only recordings, made in 1973 as part of the duo "Speedy & Red" with guitarist Willie "Little Red" Holmes, were released in England on the album Downhome Blues in 1984. Ashford died in September 1980. The French Camp/Weir area was home to another group of blues musicians, including Big Lucky Carter, who enjoyed belated recognition for his original blues in the 1990s, and R. Lee Miller. This marker can also be identified by its HM code. You can use the hashtag #HMYJQ in tweets, and any other place where you might refer to this marker, including when searching on this site.